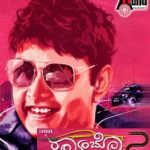 Yavva Yavva Lyrics | Raambo 2: Yavva Yavva is a song from an upcoming 2018 Kannada movie Raambo 2, directed by Anil Kumar. The film is being produced by Sharan and Atlanta Nagendra under the banner Laddoo Films. The movie is co-produced by Arjun Janya [music composer] and technicians Sudhakar Raj [cinematographer], K M Prakash [editor] will be working partners for the film. Raambo 2 features Sharan, Ashika, Ranganath and others. Aanand Audio is the music label of this movie. This song was composed by Arjun Janya with lyrics penned by V. Nagendra Prasad. Yavva Yavva was rendered by Vijay Prakash. Dhumthadhumtha Thana Dhumdhumdhum Thara Rara Thara Rara Ra..
Lyricsraaga is a portal designed to provide the lyrics of Indian movie songs across various languages like Tamil, Kannada, Telugu, Malayalam and Hindi.